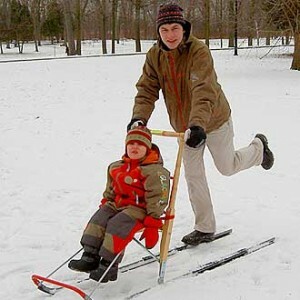 "Spark" in Norwegian means "kicks", and a spark is a kicksled, a clever Norwegian invention shown here. A BBC reporter took part in the world kicksled championships in Norway and the report is not only amusing but also has a game-theoretic aspect that might appeal to my colleagues at the UPF. Listen to the clip below to hear why it is quite OK to stop along the way during the race and have a couple of drinks at a bar - this will possibly be the key to your winning the race!